The bug in the Manhattan plot in PanelCheck 1.4.1 that we reported yesterday is fixed now and we have made PanelCheck 1.4.2 available for download. Get PanelCheck 1.4.2 at the Downloads section. We have discovered that the Manhattan plot didn't function in version PanelCheck 1.4.1. We therefore removed PanelCheck 1.4.1 and temporarily redirect download traffic to PanelCheck 1.4.0 until this bug is fixed. We are sorry for the inconvenience. Get PanelCheck 1.4.0 at the Downloads section. We have released a new version of PanelCheck, which contains a couple of small bug-fixes. This version is named PanelCheck 1.4.1. It is available at the Downloads section. Isabel de Sousa Amorim's poster with the title "Monitoring a panel for sensory evaluation of Cerrado fruit jam by using the PanelCheck software" is now available at the Publications section. The Sensory and Consumer Science group at Nofima has launched its own blog informing about most recent activities, seminars, courses, conferences attended by Nofima colleagues etc. Lauren Roger's poster with the title "Picturing panel performance: New ways to visualise your panelist's data" contained multiple PanelCheck plots. The poster can be viewed or downloaded from the Publications section. Our team is currently working on a new version of PanelCheck with new features and methods that will improve the overall usability of the software. There is no release date, but the new version should be available at the end of 2012. A PanelCheck group has been established at LinkedIn. The main purpose of the group is to provide a news channel and discussion platform for PanelCheck users. The group can be found here. New group members are welcome. Oliver Tomic will give an oral presentation at the Pangborn Symposium 2011 in Toronto. Title of the talk is: Complimentary performance indices for assessor and panel performance monitoring. 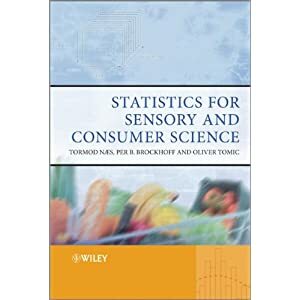 We are proud to announce that our book Statistics for Sensory and Consumer Science has been published by Wiley in June 2010. Many of the plots and methods used in the PanelCheck software are described in this book. Please find more information at Amazon or Wiley. Check the 'Publications' section for other publications resulting from the PanelCheck project. As a part of Nofima's educational PU-network "Optimise your product with sensory analysis" a one-day PanelCheck workshop will take place for the network participants on Friday, November 13. Our paper "Analysing sensory panel performance in a proficiency test using the PanelCheck software" has been accepted for publication at the journal European Food Research and Technology. Check the 'Publications' section for other publications resulting from the PanelCheck project. A pdf-document explaining how to use our PanelCheck software has been uploaded and is available in the 'Publications' section. The document is available only in Danish. Created the "PanelCheck software features" page under the "Software & Courses" menu. This page presents most of the features implemented in the PanelCheck software. Several users have experienced that they could not install PanelCheck due to a corrupted file. The PanelCheck software may now be downloaded from another location (sourceforge.net). Registration is no longer requrired. Uploaded poster of Marise Kinnear & Henriëtte L. de Kock, Department of Food Science, Pretoria University, South Africa to the publications loacation. The poster was presented at the 8th Pangborn Sensory Science Symposium in Firenze, Italy. The title of the poster is: 'Post trial investigation of sensory panellist performance using PanelCHECK'. The poster can be downloaded here. The 'Quotes' sub page has been updated, mentioning University of Copenhagen and Hochschule Neubrandenburg, University of Applied Sciences as regular uses of the PanelCheck software. We are currently working on a new release of PanelCheck. The new version (V. 1.4.0) will contain a few enhancements based on feedback from users around the world. There is no time schedule for the release of the new version, but we will keep you updated on the progress. The download of posters on the publications page has been re-organised and a scientific paper from colleagues at the University of Bologna has been added. The publication page has been updated with exact reference information on the papers that previously were marked as in press. As part of the merging process between the former research institutes Matforsk, Fiskeriforskning, Norconserv and Akvaforsk into a new research group Nofima, our old PanelCheck websites were moved to this new websites. Dahl, T. and Næs, T., Identifying outlying assessors in sensory profiling using fuzzy clustering and multi-block methodology. Funding by the Norwegian Research Council ceases on December 31, 2008. Nofima Food will, however, continue to develop the PanelCheck software and publish scientific papers in the field of assessor monitoring. Another minor release of PanelCheck. This version is 1.3.2 and fixes a bug in 3-way ANOVA where the headers in plots 'Product*Replicate interaction' and 'Assessor*Replicate interaction' were switched. We are sorry for the inconvenience. Just in time for the Sensometrics 2008 a new minor release of PanelCheck is ready. PanelCheck 1.3.1 has a few small improvementes (see changes here) and can be downloaded here. For those attending Sensometrics 2008 be sure to not miss Workshop "B": PanelChecking, which takes place on tuesday, 22 July, 2008 from 16:00 to 18:00. We are pleased to announce the official release of PanelCheck V. 1.3.0. This new version contains many new methods/plots and features for enhanced usability. Please see the changes from the previous version here. Download PanelCheck V. 1.3.0 here. Asgeir Nilsen has given a presentation at the Nordic Workshop in Sensory Science 'The Nordic Sensory Identity' in Göteborg, Sweden, May 28 - 30, 2008. The title of the presentation is 'PanelCheck - example from an intercollaborative test in Denmark and Norway' showing how to use PanelCheck in intercollaborative test. We are working with the last finishing touches of PanelCheck 1.3.0. Many new features have been implemented and unfortunately we had to delay the relase several times. But now the official release date is set to june 9, 2008 and we are looking forward to provide you the newest version to you on our download pages. 'Some examples of the use of multi-block methods for analysis of descriptive sensory data'. Tormod Næs has stepped down as the leader of the PanelCheck project at May 05, 2007. Oliver Tomic again takes over the responsibilities as the new project leader. Oliver Tomic has held a one-day PanelCheck workshop at Food Science Australia. The release of PanelCheck 1.3.0 will unfortunately be further delayed until approximately mid may 2008. We want to make sure all new features are implemented and tested properly. Please bear with us. It will be worth the wait. Tormod Næs has held a half-day PanelCheck course on february 13 at the University of Stellenbosch. 'Monitoring of sensory panel performance by the use of PanelCheck'. 'PanelCheck - a free software tool for monitoring sensory panel performance and more'. The annual Danish-Norwegian PanelCheck meeting took place in Oslo this year. Tormod Næs will be giving a sensometrics course and PanelCheck seminar at the University of Stellenbosch, South Africa in february 2008. The annual danish-norwegian PanelCheck meeting (featuring the members of the danish and norwegian PanelCheck project) will take place on 16 January in Oslo this year. Today a consortium of research scientists have met at ENITIAA, France to discuss the potential developmet of an advanced version of PanelCheck. Such a version would be aimed at sensometricians and serve as a common platform for development and testing of new methods for panel monitoring and treatment of sensory profiling data. At the meeting demonstrations of PanelCheck, SensoMineR and SensoBase were given. The participants were Dominque Bertrand, El-Mostafa Quannari, Evelyne Vigneau, Giorgio Luciano, Henning Risvik, Michel Semenou, Mohamed Hanafi, Pascal Schlich, Per Bruun Brockhoff, Phillipe Courcox, Sebastien Le, Tormod Næs, Veronique Cariou. Expected release of PanelCheck 1.3.0 is january/february 2008. Among the highlights of new features are the handling of missing data, interactivity in plots for easier use, Bi-plots in PCA and many more. There has been great interest in our PanelCheck courses (november 28 - 30) and now for both courses the maximum number of participants has been reached. Our apologies to those who did not get the chance to participate this time. We plan to arrange a new course in June 2008. Exact dates and locations will be announced as soon as these details are settled. Tormod Næs has taken over the responsibilities as the new leader of the PanelCheck project. The newest versions of the following software products now have specific functions that automatically open PanelCheck from within the software and load your collected data into PanelCheck. In this way data import into PanelCheck is done conveniently with only a few clicks instead of importing via Excel or text files. The PanelCheck team would like to thank Compusense, Biosystemes and Logic8 for their friendly cooperation. Oliver Tomic will step down as the leader of the PanelCheck project at September 1, 2007. Tormod Næs will take over the responsibilities as the new project leader. New PanelCheck courses will be held in Copenhagen on November 28 - 30, 2007. Official release of PanelCheck V. 1.2.1. This new version contains many new methods/plots and features for enhanced usability. Please see the changes from the previous version here. Download PanelCheck V. 1.2. here. The release of the new version of PanelCheck 1.2.1 will be delayed a bit. It should be out next week, though. Thank you for your patience. Asgeir Nielsen presented on the ESN seminar in Porto, Portugal, May 08 - 09 how to check panel consistency and data variability in pre-testing evaluations by using PanelCheck. New PanelCheck courses will be held in Copenhagen on June 19 - 21. Minor updates on web-pages, fixing dead links, etc. Development of PanelCheck 1.2.0 is in progress, with many new features for enhanced usability. New plots will be implemented as well. Simple graphical techniques can be utilised to investigate the performance of individual assessors and to detect individual differences among assessors in a sensory panel. By visualising different type of information in a set of various plots the panel leader can extract relevant information without the need of extensive knowledge in statistics. The joint information content gained from the plots can then be used as a basis for selective training in order to improve performance of single assessors and the panel as a whole. Six sensory panels, both industrial sensory panels that usually perform quality control and trained laboratory panel, took part in an inter collaborative test evaluating six fruit jelly samples using sensory descriptive analysis. Six attributes were used to describe the samples with repeated measurements. The composition of the fruit jelly samples was based on an experimental design with varying levels of sugar, acid and stabiliser. Various plots can be generated with PanelCheck to visualise panel performance. To compare results from the inter collaborative test the following plots were utilised: Tucker-1 common scores and correlation loadings plots, correlation plots and line-plots. We have recieved feedback from a few users that they had problems starting up PanelCheck V1.1.0 due to the following missing dll-file: MSVCP71.dll. This error is most likely to occur when installing PanelCheck on a PC that did not have PanelCheck installed previously. If you have this problem: how can you fix it? 2. Download and install this one: PanelCheck V.1.1.1. Release of PanelCheck v. 1.1.0. We are pleased to announce the release of PanelCheck v. 1.1.0 with a great deal of new features. This should further improve usability and increase your efficiency when exploring the data of your sensory panel. Get more information about the new features here. Get the latest release for free from the download pages. The first PanelCheck courses are to be held from february 20 -22, 2007. Margrethe Hersleth has stepped down as the leader of the PanelCheck project. Oliver Tomic will take over the responsibilities as the new project leader. The webpages have been updated with new information. The unicode error that appeared on danish Windows XP systems is now finally solved with PanelCheck v. 1.0.3. See news message from May 30, 2006. Release of PanelCheck v. 1.0.3. 1. In previous versions PanelCheck might return a false F value for attributes where that assessor has zero variation for that attribute. This affected F plot only. MSE plot and p*MSE plot were not affected of this. This is fixed in PanelCheck v. 1.0.3. 2. When disabling one or more attributes in the attribute checkbox-list, the 'Raw Data'-button in the plot returned wrong data. This did NOT affect the calculation of any of the plots. This is fixed in PanelCheck v. 1.0.3. Other than that there were some smaller enhancements in the user-interface of the PanelCheck. The Tree-Controls (left side of the panel) that produce plots by double-clicking them have got different colours, such that attributes and assessor can be distinguished easily. See all changes. More detailed information about the courses for the use of PanelCheck are now available. Release of PanelCheck v. 1.0.2. This release handles problems that some users experienced when reading data from Excel files. Added a progress bar that indicates how much time loading of sensory data will take. Read the changes from the previous version. "UnicodeEncodeError: 'ascii' codec can't encode character u'\xe6' in position 15: ordinal not in range(128)"
We are working hard to fix this problem and hopefully we will come up with an solution soon. Release of PanelCheck v. 1.0.1. Read the changes from the previous version. Get the latest release for free from the download pages. First official release of the free software tool PanelCheck. This is version 1.0.0 that will be presented at the Nordic Workshop in Sensory Science.